Okay, okay...I am guilty of my first "clickbait" post title. The discussion that came out of this was interesting and most unexpected. 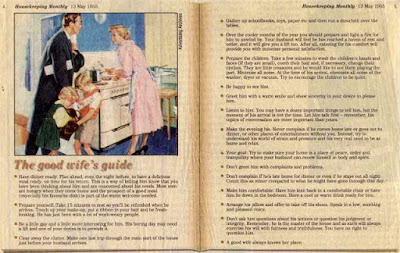 One young woman raised her hand and said that, while, of course, the condescending language and ideas in the piece were absurd, the idea of the "homemaker" was not a bad one. She pointed out that, with all the work to be done, one person taking care of the domicile while one went out and made the money was, actually, an ideal situation; very efficient and practical. She also said that it was not absurd, then, for the woman to be expected to make dinner and do all other home-related jobs. This lead to a more controlled discussion than you might think. What I think is that the old setup was, indeed, better. Not because the woman stayed home but because someone did. A house is a big responsibility. It is logical to run things that way. Now that we have (almost) gotten over the idea that the man has to be the worker and the woman has to be the housewife, maybe we should go back to the "homemaker" concept as a goal. If one person makes enough money, be it the man or the woman, the other really should stay home. It makes sense. It is (was), I think, a better way to run a household. But we would need get over two difficult hurdles: greed and stereotype. Are we capable of deciding when we are making enough money to give up an income? Can we escape the old gender job-assignments? Some of us can, but maybe anyone who has the means should try. I know that if I started to list the benefits of the worker/homemaker model, this piece would run much, much longer. High-school kids are too young to remember what that other, older world looked like, but I think before they start deciding what's better or worse, they need to have a full sense of these historical trade-offs.